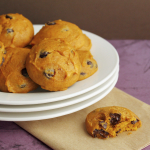 Satisfy that holiday sweet tooth with this healthy Pumpkin Spice Cookies recipe! Look for aluminum-free baking powder the next time you go shopping. Aluminum may pose potential risks to our health as a neurotoxin. While the dose makes the poison, some studies show a relationship with aluminum that is stored in the body and neuro-disorders (such as Alzheimer’s disease.) Limiting exposure to all metals is a protective measure we can take to optimize our health. Mix the pumpkin, syrup, apple sauce, vanilla and shortening (or oil if using) in a large bowl. Alternatively, place in a blender and blend until combined. In a separate medium bowl sift the oat flour, almond meal, baking soda, baking powder and spices together. Add the dry ingredients to the pumpkin mixture and mix to combine. Then fold in the pecans and chocolate chips. Scoop 1-tablespoon of batter onto a large baking pan lined with parchment paper. Repeat until all batter is used. Bake for 20 to 25 minutes, or until just slightly firm. Store uneaten cookies in a sealed glass container at room temperature for 2 days or in the refrigerator for up to 5 days.